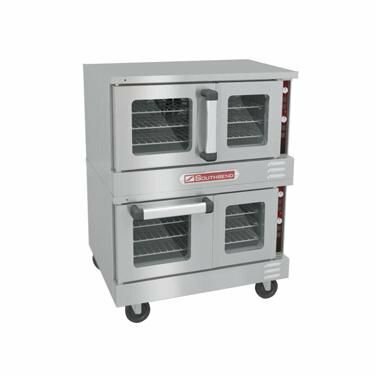 Southbend's SilverStar Convection Oven, gas, double-deck, bakery depth, cook-&-hold, deep oven, solid state controls, stainless steel front, top & sides, aluminized steel rear, interior light, 6" stainless steel legs, 144,000 BTU, 120v/60/1-ph, NEMA 5-15P, (2) 1/2 HP, CSA, NSF. 2 year parts & labor, 5 years warranty on doors (parts only, excluding door glass), std. Specify Gas Type. Standard power system. (2) 120v/60/1-ph, 7.9 amps, NEMA 5-15P, standard. 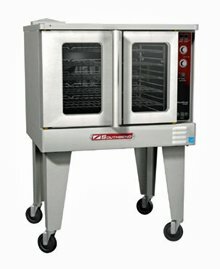 Southbend's Convection Oven, electric, single-deck, standard depth, solid state controls & 60 minute cook timer, dependent glass doors, (5) wire racks, 11-position rack glides, 2-speed fans, interior light, porcelain interior, stainless steel front, top & sides, 26" painted steel triangular legs, 7.5 kW, 1/2 HP, cCSAus, NSF, ENERGY STAR®. 1 years limited parts and labor warranty (contact factory for details). 1180866, OVEN SAFETY VALVE. 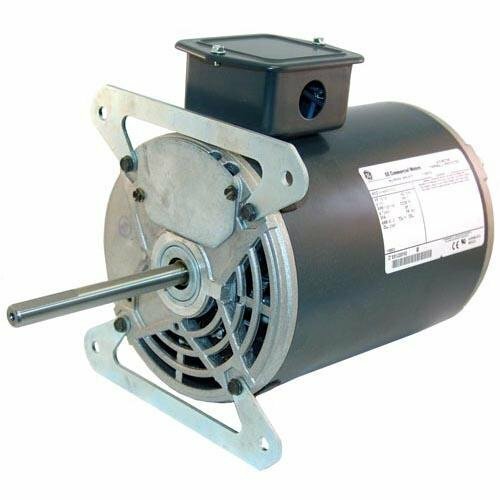 Southbend Range Genuine OEM replacement part. For over one hundred years, Southbend has produced the finest in heavy-duty ovens, ranges and steamers. Use genuine OEM parts for safety reliability and performance. 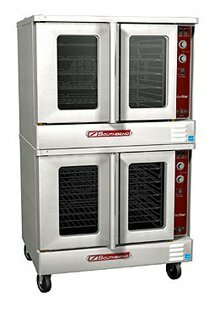 Southbend's MarathonerGold Convection Oven, gas, single deck, cook & hold, bakery depth, electronic ignition, solid state controls, interior lights, includes (5) racks, stainless steel front, sides, top, rear jacket & 26" legs, 90,000 BTU, CSA, NSF. 3 year parts & labor, 5 years warranty on doors (parts only, excluding door glass), std. Gas Type to be specified. Standard power system. 120v/60/1-ph, 8.9 amps, NEMA 5-15P, standard. Southbend's Bronze Convection Oven, gas, single-deck, standard depth, solid state controls, 60-minute cook timer, electronic ignition, (5) wire racks, 11-position rack guides, 2-speed fan, oven interior light, stainless steel front, top, sides & door, porcelain interior, 26" painted steel triangular legs, 7.9 amps, 120v/60/1-ph, NEMA 5-15P, 1/2 HP, 40,000 BTU, CSA, NSF, ENERGY STAR®. 1 year parts & labor including doors warranty, std. 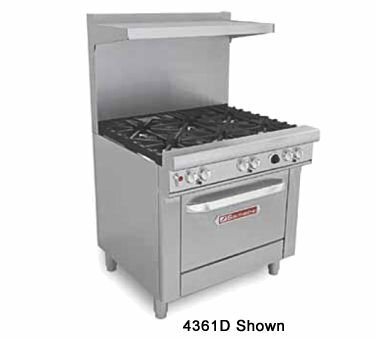 Southbend's Platinum Heavy Duty Range, gas, 36", (2) 35,000 BTU open burners, (1) 24" charbroiler, manual controls, (1) convection oven, includes (3) racks, stainless steel front, sides, rear, exterior bottom & 6" adjustable legs, 179,000 BTU, CSA, NSF. Standard (3) years limited parts and labor warranty. NOTE: 5" flue riser, standard. 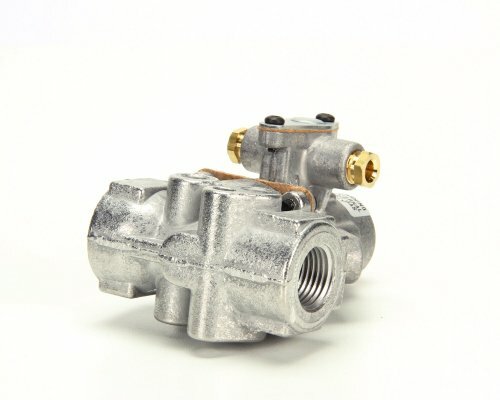 Gas type to be specified (gas pressure regulator required for individual unit). 115v/60/1-ph, 5.9 amps, cord & plug. 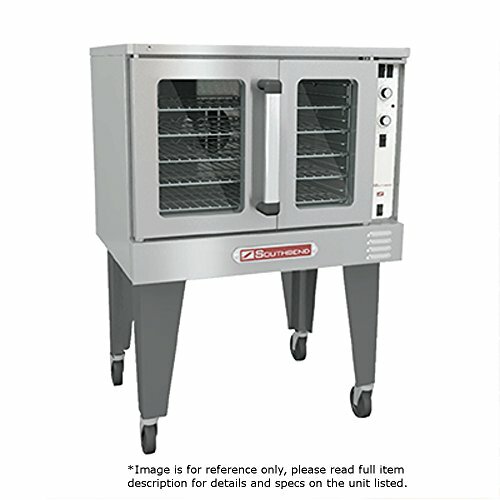 Southbend's TruVection Convection Oven, gas, low-profile, double-deck, electronic ignition, 150-550°F solid state thermostatic controls, 60 minute mechanical cook timer, oven interior light, cool down fan, includes (3) racks per oven, porcelain oven interior, stainless steel door handle, front, sides, top & 6" legs, (2) 1/2 HP, 104,000 BTU, CSA, NSF. Standard (1) year limited parts and labor warranty when purchased as a stand alone base or stacked model unit. Gas type to be specified. (2) 120v/60/1-ph, 7.9 amps, 6' cord, NEMA 5-15P, standard. 6" stainless steel legs, standard. 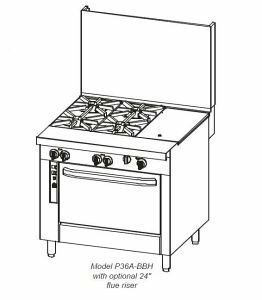 Southbend's Ultimate Restaurant Range, gas/electric, 36", (2) non-clog burners, standard grates, (1) 24" griddle left, standing pilot, (1) electric hybrid convection oven, includes (3) racks, 22-1/2" flue riser with shelf, stainless steel front, sides, shelf & 6" adjustable legs, 114,000 BTU, cCSAus, CSA Flame, CSA Star, NSF. Standard one year limited warranty (range). NOTE: 22.5" high flue riser, with heavy duty shelf, standard. Gas type to specified. 208v/60/1-ph, 32.0 amps (oven 6.0kw), standard. At Southbend, we pride ourselves on being experts in the food service industry. We know how our customers work and what equipment works for them. Our convection ovens have all the features a busy kitchen needs from the inside out. 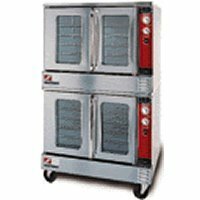 Compare prices on Southbend Convection Oven at ShoppinGent.com – use promo codes and coupons for best offers and deals. Start smart buying with ShoppinGent.com right now and choose your golden price on every purchase.